Smoke & Summons by Charlie N. Holmberg first caught my attention with its synopsis, but I became even more intrigued once I realized what I was looking at on the cover was the head of a fiery demon-like horse. The reason for this striking motif was soon revealed, as the story introduces readers to Sandis, who is no ordinary young woman. For one, she is a vessel, whose body is trained and primed to hold demon-like spirits called forth from the netherworld. She is also a slave of sorts, kept under lock and key by a cruel summoner named Kazen, who has captured a number of kids like Sandis for his nefarious purposes. And because what Kazen does is highly illegal, he operates underground in a top secret facility where he can hide his activities as well as keep his charges isolated and unaware of what’s going on in the outside world. This in essence is Sandis’ life, where all she does each day is keep her head down and obey the rules, as not to anger Kazen. After all, it’s painful enough what happens to her whenever he calls forth “her” demon, the fire horse Ireth, into her body. But then one night, Sandis witnesses something at the facility that frightens her to her core, prompting her to leave immediately, escaping into the unfamiliar city. Her only hope is a name of an unknown relative she chanced to glimpse in Kazen’s records, perhaps a distant uncle who would recognize their kinship and protect her. Instead, Sandis finds Rone, a caddish thief who thought the poor lost girl would be easy prey to his charms. But to his surprise, it is actually Sandis who catches him off guard and ends up making off with something valuable of his: an extremely rare and powerful artifact called amarinth which grants its bearer immortality for one minute every day. To get it back, Rone tracks down Sandis, but then winds up getting swept along in her desperate attempt to escape Kazen and his minions. Understanding that the two of them need each other to survive, Sandis and Rone strike up a reluctant partnership. She needs to lie low until she can find her mysterious relative, and he’s hoping that the reward for helping her will earn him the money to free his mother from jail. I’ll be honest, I think I would have enjoyed this book more had I not disliked the characters right off the bat. On the whole, Sandis was all right, even if her meekness sometimes bothered me—though at least this was in keeping with her background and history. Rone, on the other hand, was infinitely punchable and irritating. I despised his smugness and arrogance the moment he showed up on the page. He is also impulsive and shows an astounding lack of foresight and awareness of potential consequences. He has little consideration for others and barely ever thinks beyond his own self interests. It’s hard to feel bad for him when you know his own bad decisions are the cause of all his troubles. The reason he gets tangled up with Sandis is because he thought he could take advantage of her. The reason his mother is arrested is because she wound up being blamed for a crime he himself had committed. This guy thinks he has all these problems when, really, he is the problem, but of course, he’s too self-centered to realize it. And the worst part? I don’t think Rone changed all that much. It would be one thing for an unlikeable character to redeem themselves throughout the course of a story, and though Rone did show some signs of turning around, when the moment of truth arrived in the second half of the novel, he completely blew the chance to prove himself and made me angry at him all over again. I’m glad I didn’t waste my sympathies on him, though I did feel bad for Sandis. There were times where I felt the author might have been hinting at an eventual romance for her two characters, but I was never really able to feel much of anything, let alone a spark of chemistry, between them. One reason for this is the power and knowledge imbalance where it seemed Rone always held all the cards despite Sandis being the one with the ability to channel a demon horse. He went freely about the world while she remained stashed away in some hidey hole as she always was, the naïve and innocent girl. The relationship had all the ingredients of one heading straight for trouble, but even when it turned out I was right, the confirmation brought little satisfaction. But now, for the things I did like: without a doubt, the whole premise of summoning demons into human vessels was the most intriguing and memorable aspect of the book. There is an entire system involved in the process, from the blood sacrifices it requires to the permanent scars carved into a vessel’s flesh. Each individual vessel also has a power level associated with him or her, determining the strength of the demon that can be summoned. And then, there was Rone’s amarinth. As magical trinkets go, it doesn’t get much cooler or more imaginative than that, and reading about its effects immediately made me curious to know more about the object and others like it. Suffice it to say, a lot of hard work was put into developing the magic of this universe, given its layers upon layers of rich detail, and as a fantasy fan, I always delight discovering new and unique world-building. Still, at the end of the day, I’m a “characters first” kind of reader, and admittedly, my loathing for one of the key characters most likely impacted my overall enjoyment of this novel. 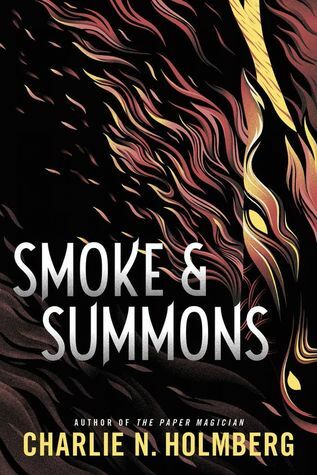 Still, I didn’t think Smoke & Summons was a bad book, despite having to put up with Rone, and I actually find myself curious to see how he and Sandis can move forward in the wake of the choices he made. Both are now changed from the experience, which should make the next book interesting. Nice & detailed review, Mogsy! I liked the cover of this book too. Agreed, at first I wasn’t sure what I was looking at on the cover, but once I realized, I thought it was so cool! Well Mogsy meek characters or ones I dislike would always make difficult to really like a story! I am character driven first! Yeah, in this case, my enjoyment was definitely affected. Maybe not to the point of “ruining”, but it did hurt the rating! I do agree about Rone, but I think he will be redeemed later. I have a theory that has to do with the whole church thing, but we’ll see. Great review! I really hope so! I’m just glad that Sandis let him have it at the end there. Loved that she finally showed up backbone! Yes, I loved that too! I have a copy of this but only because I had to chose one of the Kindle First free books last month. I actually never realized I was looking at a fiery demon horse. I’m in no hurry to read this one but it sounds like there are at least some decent elements to it. Funny enough, I had also grabbed this as part of the Kindle First program before a review copy showed up at my door! Agreed, Rone is a mess. And I really hope the next book addresses that and we see some growth from him. Haha, yeah, not even a mess in a good way, but in an annoying, infuriating one! ARGGGH! Yeah, it’s such a shame when a character I dislike drags everthing else down. I’ve looked at this cover several times in passing and only now with your guidance do I see the fire horse! Sounds like this is a read that might be worth checking out down the road, but not a high priority. Thanks for the review! Yeah, it’s a fine line between unlikeable, dickish characters you love to hate, and characters that are so irritating you just downright hate! Haha! Yeah, sadly Rone is a huge part/POV of the book so at times it was a struggle. I actually didn’t mind Sandis’ meekness so much; even though it made her a dependent and submissive character, I think she was written well because her personality made sense with her background. Rone, on the other hand, just annoyed me to no end! Oh dear – I completely understand, it’s so difficult to get on board if you simply dislike or can’t get on with the characters. Yeah, I’m a “characters first” reader, it’s really hard to get into a book if I don’t like the protags!